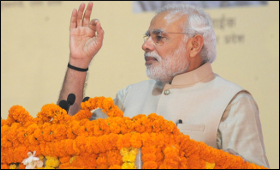 Prime Minister Narendra Modi on Wednesday urged Congress President Rahul Gandhi and other politicians, sportspersons, actors, business leaders to encourage maximum voter engagement in 2019 general elections in April-May. "I appeal to Rahul Gandhi, (West Bengal Chief Minister) Mamata (Banerjee), (NCP chief) Sharad Pawar, (BSP supremo) Mayawati, (SP chief) Akhilesh Yadav, (RJD leader) Tejashwi Yadav and (DMK chief) M.K. Stalin to encourage increased voter participation in the upcoming Lok Sabha polls. A high turnout augurs well for our democratic fabric," he tweeted.